1. Is it too late to join? - It is definitely not too late! This quilt-a-long has a nice slow pace with a month between instructions so there is plenty of time to get caught up! And now onto the instructions... this month we are going to make a few half square triangles (HST) and start with some block assembly. 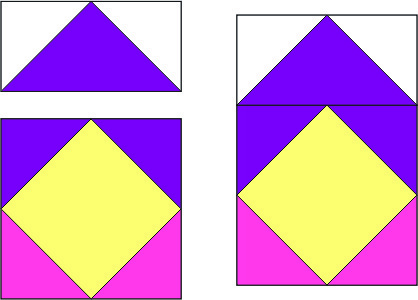 Combine the following fabric squares to form Half Square Triangle Units (HST units) using the method below. 2 Fabric A squares (4” x 4”) and 2 Fabric B squares (4” x 4”) to form 4 A/B HSTs (3 ½” x 3 ½”). 2 Fabric B squares (4” x 4”) and 2 Fabric C squares (4” x 4”) to form 4 B/C HSTs (3 ½” x 3 ½”). 2 Fabric C squares (4” x 4”) and 2 Fabric D squares (4” x 4”) to form 4 C/D HSTs (3 ½” x 3 ½”). a. Place the squares (4” x 4”) right sides together. Draw a diagonal line using a removable marking device on the back of the lighter square (shown as the solid line). b. Sew ¼” on either side of the solid line (dotted lines). Cut on the solid line and press seam open or towards the darker fabric. c. Trim each HST unit to (3½” x 3½”). d. Repeat to form 4 A/B HST units, 4 B/C HST units, and 4 C/D HST units (3 ½” x 3 ½”). 1. Unit 1 - Combine 18 Flying Geese Units and 18 Square in a Square Units to form 18 Unit-1 as shown. Each Unit-1 should measure 9 ½” x 6 ½”. 2. Unit 2 - Combine 16 Flying Geese Units, 16 Square in a Square Units, and 8 Fabric A squares (6 ½” x 6 ½”) to form 8 Unit-2 as shown. Each Unit-2 should measure 24 ½” x 6 ½”. 3. Unit 3 - Combine 4 Fabric A/B HST Units, 4 Fabric B/C HST Units, 4 Fabric C/D HST Units, and 2 Fabric A rectangles (6 ½” x 3 ½”) to form 2 Unit-3 as shown. Each Unit-3 should measure 24 ½” x 3 ½”. Wow, some block assembly already? Yay! Many thanks, I was ready for more!! Hi Cheryl, I have made my units but wanted to check - does it matter how we press the seams? Should we press the, open? Or does it not matter? Thanks! I'm all caught up and ready for this step. Which is really unusual for me with a mystery quilt. Looking forward to seeing next year's mystery, I'm really enjoying this one.